What a pleasure! Even before the main event, a short "For the Birds" perches on the screen for four or five minutes. Without a single human word (though more than a few peeps) the short speaks a beakful about human nature via careful timing, color and graphic visual humor. Perfect -- my cheeks hurt from smiling so much. Ah, then the monsters take the screen. Brilliantly twisting the "bogeyman in the closet" phenomena -- these monsters are terrified of humans. But since human screams can be converted into electricity for the monster world, professional "scarers" are sent into the human world to fill pressurize capsules with pure human child scream. No doubt designed with the overt intention of creating an amusement park ride, monsters enter our world through doors that are cabled into an industrial scare factory then mounted to individual stations. Each door is unique. Later, our protagonists take a ride on the conveyer-cable system, their motion fills our stomachs with butterflies even though we are stationary. Speaking purely from an adult perspective, aside from a short lull in story (but not action) early on, "Monsters" never stops being clever. 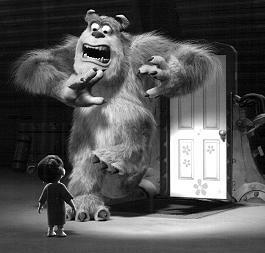 From the brilliantly detailed animation (every fur hair on Sulley's back flows) to the non-stop throwaway comedy of Billy Crystal's one-eyed lime-green guy to the sharply written script, "Monsters" is real entertainment. When big blue Sulley undergoes a series of fainting episodes, I swear I laughed so hard, tears were streaming down my cheeks. Then when he is reunited with the only human to breach monster security (a little girl), tears again took to my cheek this time prompted by a swollen heart. And to top it off, Disney digitally projected our particularly showing, so the quality of the image on screen played picture perfect. No scratches, pops, discoloration, or projector-spool rocking (because there was no film) - only a starburst colorful rock solid image. See it. And if you haven't seen "Toy Story" and "Toy Story II" see them as well. These are some of the best movies of our time. Monsters, Inc.. Copyright © 2001. Rated G.
Starring John Goodman, Billy Crystal, James Coburn, John Ratzenberger, Steve Buscemi, Bob Peterson, Jennifer Tilly and Mary Gibbs as Boo. Screnplay by Andrew Stanton & Daniel Gerson. Orginal Story by Pete Docter, Jill Culton, Jeff Pidgeon, Ralph Eggleston. Produced by Darla K. Anderson at Disney/Pixar.